Training Platform for Automobile Air Conditioning System. This training board uses a Chevrolet Cruze model based on an entire automatic A/C system that fully supports auxiliary systems. It demonstrates the entire vehicle structure and operation, leading to its wide usage in teaching electrical theory, practical operation, fault diagnosis and other mechanical or engineering vehicle operations in the higher, vocational colleges and training institutions. 1. Speed control motor as the power source, properly working automatic A/C system, which operates in a steady manner and shows the entire structure and working principle of the A/C system. 2. The bench plate is assembled with a high/low pressure gauge to directly show pressure changes in the refrigeration pipe. 3. An assembled digital indicator gauge shows the related sensors’ static value and dynamic value. 4. The training bench is equipped with automatic A/C system color schematics and detection terminals. The element signal parameter of A/C system, such as voltage, resistance, frequency, and other parameters can be detected using special instruments. 5. 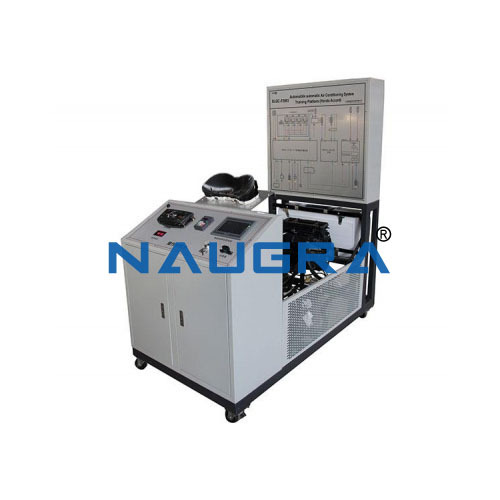 The training bench is equipped with diagnostic blocks and can be connected to a dedicated or universal car decoder for reading the entire vehicle’s electrical fault codes, clear fault codes, read data stream, actuate components test, parameter settings, waveform analysis, and other self-diagnostic functions. 6. Fault setting and appraisal system: use the fault setting box set manually or delete single and combination faults, including all the sensors, actuators and controller faults. Fault setting types: disconnection, short circuit, and virtual connection- turn the fault switch to the original position, and the fault is deleted. Users can set any recombination fault and delete the original fault. Using concealed fault settings is convenient for student testing, and the instructor can set various hard emulation faults in the sensors and controlling unit (example: magnetic, thermosensitive, pressure-sensitive, photoelectric, and electromagnetic). The fault type is signal distortion or accidental fault. 7. The training board is assembled with a protection cover. 8. A mobile device with locking casters moves freely to better facilitate teaching.